All that seems to be missing from the simulation of the USS Koa Kai steaming up a channel into Pearl Harbor is the feel of saltwater being tossed about by the whitecaps hitting the side of the warship. "The bridge" of the Koa Kai sits on the second floor of a concrete building in the middle of Ford Island and is just part of a $1.1 million simulator dedicated by the Navy on Wednesday. Rear Adm. Timothy Alexander, commander of Naval Surface Group Middle Pacific, said the seamanship, navigation and ship-handling simulator "can do everything for you" from routine maneuvers to more complicated emergency procedures. It is one of seven developed for the Navy by Kongsberg Maritime Simulation, the largest manufacturer of bridge simulators. 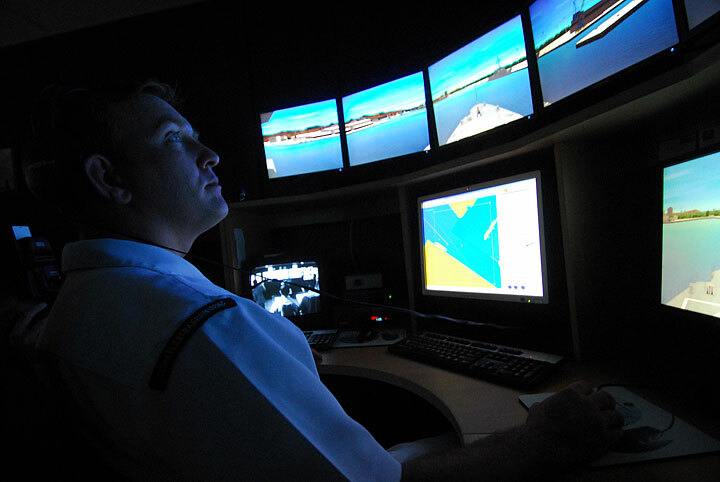 The heart of the system is a large-scale pilot house mock-up with seven large monitors that provide a 240-degree panoramic view from the bridge of a naval warship. "It's about as realistic a view as you can get in a simulator," said Lt. Bob Arias, topside warfare officer at Pearl Harbor's Afloat Training Group Middle Pacific. "We can now train a full bridge team," he added, "and even put them in harm's way without worrying about hurting a sailor." The bridge replicates the environment found on the bridge of any U.S. Navy warship with a radar station on the left side of the bridge, a navigation station on the right and the helm in the middle. To add to the realism of the training environment the sound of the ship's engine, whistle and bells and even the wind is piped into the pilot house of the bridge. Computer-generated imagery like wind-driven whitecaps adds to what appears to be the movement of the ship as it reacts to the conditions around it. At times, the "ship" seems to roll or sway. About two dozen computers are controlled by a technician in an adjacent classroom to support the bridge simulator. Besides Pearl Harbor, the simulator's data banks also include other ports in the Pacific as well as the Persian Gulf. There is a lot of attention to detail -- down to a flag pole in the Pearl Harbor channel that is supposed to serve as a visual aid to a bridge crew. Herb Taylor, president of Kongsberg Maritime Simulation Inc., said the way the American flag is waving can help the navigation crew determine wind direction and speed. As the Koa Kai moves through the channel it will pass familiar Pearl Harbor landmarks such as the alabaster USS Arizona Memorial. Cmdr. Robert Tortora, commanding officer of the Pearl Harbor-based destroyer USS Chafee, said locating the simulator at Pearl Harbor is cost-effective since the Navy won't have to send sailors to the mainland for training. There also is the advantage of using the simulator to orient his bridge crews to ports like Hong Kong and Singapore before they leave Hawaii. 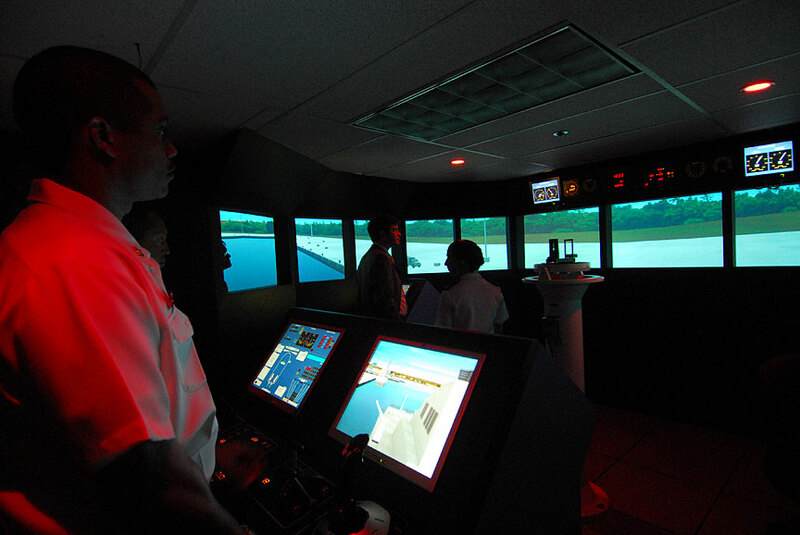 Taylor said bridge simulators also are located in Sasebo and Yokosuka in Japan, Florida, San Diego and Virginia. Pearl Harbor also has smaller trainers that can be used by individual sailors to learn to steer a ship.